Effective healthcare consists of more than medical diagnoses and treatments. A successful medical program requires staff leaders and business managers. Online colleges for healthcare management help you advance in this competitive career and prepare you for entry- and mid-level management roles that command average salaries of $98,350. 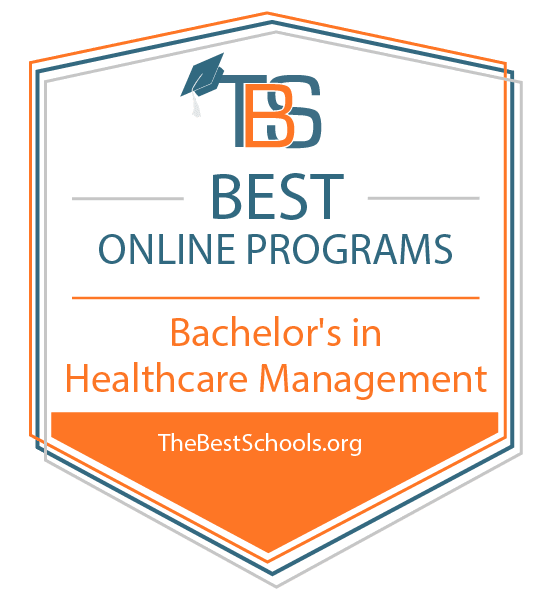 The bachelor’s in healthcare management online program offers access to careers that are increasingly in-demand as the baby boomer generation ages and requires more access to healthcare services. In fact, the Bureau of Labor Statistics (BLS) projects 20% employment growth in this field by 2026. A healthcare management degree online teaches students how to improve the efficacy and quality of care in medical settings. Learners study general management skills and how to oversee and streamline care from plan to delivery. Comprehensive courses focus on multidisciplinary learning objectives and may cover topics like healthcare concepts, ethical and legal considerations, risk management, and leadership skills. Many online degrees in healthcare management allow students to choose a concentration such as emergency management, criminal forensics, human resources, or healthcare marketing. Online bachelor’s degrees in healthcare management differ in both graduation requirements and completion timelines. While most are delivered asynchronously online, some include hybrid options and require group projects. Many programs call for an on-site internship at a medical facility or the completion of a capstone project prior to graduation. Healthcare management degree online programs generally take four years of full-time study to complete, though some tailor programs to students with previous college credit. These selections can be completed in as few as two years. What Will I Learn in an Online Bachelor’s in Healthcare Management Program? What Are the Best Online Bachelor’s in Healthcare Management Programs? East Carolina University ranks #1 on The 25 Best Online Bachelor’s in Healthcare Management Degree Programs! East Carolina University serves as the third-largest college in North Carolina; twelve colleges and schools administer programs to nearly 29,000 students. ECU’s catalog includes 84 bachelor’s degrees delivered to students in classrooms with an 18-to-1 student-to-faculty ratio. North Carolina’s leader in distance education, ECU provides a suite of degree completion options for undergraduates. Students in the hybrid bachelor of science in health services management study as a cohort. Faculty design the 124-credit curriculum for healthcare practitioners and others hoping to advance to managerial and supervisory roles in healthcare. The curriculum, certified by the Association of University Programs in Health Administration, requires that students transfer general education credits from previous college coursework. Working professionals who hold an associate degree can choose the allied health management concentration to advance their careers in healthcare administration. Traditional students can opt for the health services management concentration to prepare for entry into either mid-level management careers in healthcare or into graduate school. Both tracks share some common coursework, including quality management in healthcare, healthcare payment systems, health data management, and how to manage the health of populations. Students can participate in internship opportunities at leading healthcare providers in the community. Licensed practitioners who hold associate degrees receive up to 30 credits for their training. Students pursuing careers in healthcare administration may join the Future Health Care Executives, a professional club from ECU. Admission to the BS requires a minimum of 33 credits of foundational courses with a minimum 2.5 GPA. George Washington University, GW Online ranks #2 on The 25 Best Online Bachelor’s in Healthcare Management Degree Programs! Established in 1821, George Washington University offers a world-class education just blocks from the White House. Students learn on three campuses in the D.C. area and through an increasing number of eLearning options. GW’s location in the nation’s capital gives learners access to internship opportunities at prominent institutions. Students interested in administrative healthcare careers enroll in the 120-credit bachelor of science in health sciences in clinical management and leadership. Designed with working professionals in mind, the BSHS provides a degree completion option for those working in the health sciences. The curriculum cultivates learners' proficiencies in administrative functions, leadership and group effectiveness, operations and information management, and adapting to the evolving healthcare field. The curriculum includes general education in subjects such as English, the social sciences, and the humanities. The major requires 60 credits of coursework focused on financial management, quality improvement in healthcare, informatics in health sciences, and health policy and the healthcare system. GW offers dual-degree options that enable BSHS students to complete their master’s in an accelerated time frame. Dual degree options include the BSHS and MSHS in clinical research administration and the BSHS in clinical research administration and MSHS in regulatory affairs. Some students transfer up to 60 credits into the BSHS and earn up to 39 credits for advanced training as an EMT or RN. Admission requires school transcripts from all previous colleges. Dallas Baptist University ranks #3 on The 25 Best Online Bachelor’s in Healthcare Management Degree Programs! Students integrate faith and learning through programs offered by Dallas Baptist University. DBU’s programs in the arts, sciences, and professional studies produce servant leaders in their respective fields, and students learn in classrooms with a 13-to-1 student-to-faculty ratio. DBU, a pioneer in eLearning since 1988, offers 75 fully online degrees and hundreds of online courses. The 120-credit bachelor of arts and sciences in healthcare management includes general education requirements in math, kinesiology, and religion. The 30-credit major trains administrators in management principles, finance for healthcare managers, legal issues in healthcare management, and human resource management for healthcare organizations. Faculty use courses in marketing, management communication, and information systems to cultivate business competencies applicable to the healthcare setting. A notable course on organizational behavior examines group dynamics and their impact on managerial decision making. An advanced management seminar focuses on the issues facing healthcare and the evolving role of healthcare administrators. One of the top healthcare management online degrees, DBU accepts transfer credits with the caveat that students complete 30 of the last 36 credits in residence. The school also awards credits for American Council of Education-approved corporate or military training. Students earn credits in specific subject areas through the CLEP program. In addition to financial aid options, DBU provides payment plans to help students pay for tuition. Admission requires college transcripts for transfers. Liberty University Online ranks #4 on The 25 Best Online Bachelor’s in Healthcare Management Degree Programs! Liberty University integrates rigorous academics with a Christian foundation at the undergraduate and graduate levels. LU’s comprehensive virtual college offers hundreds of online and hybrid degrees. While the school offers many Bible-related programs, learners choose degrees from a full complement of disciplines. The 120-credit bachelor of science in business administration offers a specialization in healthcare management. Students complete the degree fully online as they develop business proficiencies in general finance, accounting, and marketing. Students take four courses in the specialization, covering healthcare administration, healthcare informatics, HR management, and legal issues in HR. Faculty incorporate faith with academic coursework so students learn how to apply their values in the workplace. Online learners enjoy comprehensive support services including online tutoring from the Writing Center, resources from the Academic Success Center, and an online library. Faculty deliver the program using eight-week courses. Students transfer up 90 credits into the healthcare management online degree. LU offers stable tuition rates, book vouchers for undergraduates, and tuition discounts for the military. The program admits students eight times each year. Admission requires a high school diploma or GED with a minimum 2.0 GPA. Liberty University is regionally accredited by the Southern Association of Colleges and Schools Commission on Colleges (SACSCOC). The BS in business administration is fully accredited by the Accreditation Council for Business Schools and Programs (ACBSP). Colorado State University – Global Campus ranks #5 on The 25 Best Online Bachelor’s in Healthcare Management Degree Programs! Colorado State University-Global Campus designs online degrees with working professionals in mind. The virtual college offers degrees that emphasize the career-relevant skills students need to advance their careers. Learners in the bachelor of science in healthcare administration and management acquire business skills with courses in management, finance, marketing, and effective decision making. Students earning the healthcare management degree online focus on healthcare economics, managed care and health insurance, healthcare information systems, and quality and risk management in healthcare. Students can use 15 credits for a specialization that tailors the degree to their professional goals and interests. Options include criminal forensics, information technology operations, and data management and analysis. A practicum provides learners with hands-on experience under the supervision of senior staff at a partnering organization; faculty require that students complete 80 hours of fieldwork over eight weeks. CSU-Global offers a dual enrollment option in which qualified students in this program gain early entry into the master of healthcare administration and management. Students apply nine credits to both degrees to facilitate accelerated completion. Faculty deliver programs using eight-week terms that facilitate accelerated degree completion. The school provides learners with extensive support services, including online tutoring, career counseling, and 24/7 support for non-academic challenges. CSU-Global offers competitive tuition rates and one tuition regardless of in-state or out-of-state residency. Admission requires at least 12 credits with a minimum 2.3 GPA. Colorado State University-Global Campus is regionally accredited by the Higher Learning Commission (HLC). Oregon Institute of Technology ranks #6 on The 25 Best Online Bachelor’s in Healthcare Management Degree Programs! Oregon Tech offers 43 degree options to 5,000+ students at its locations throughout the Pacific Northwest. Oregon Tech Online provides students around the country with access to degree completion options in a growing number of fields. The 182–205 credit bachelor of science in healthcare management allows healthcare professionals to earn credits toward a degree completion program. The degree offers a healthcare management core and two specializations — clinical and radiologic science — for individuals planning to purse managerial or supervisory roles at healthcare facilities. Learners transfer credits into the online degree in healthcare management and receive additional credit for professional licensure. Each specialization requires general education courses in math/science, communication, and social sciences. Both also require 59–74 credits in the healthcare management major, covering subjects such as business law, quality in healthcare, cases in strategy and policy, and healthcare information systems management. Required registration on the American Registry of Radiologic Technologists (ARRT) satisfies specialized radiological science coursework. Faculty require students to complete a senior project and applied managerial internship. Oregon Tech notes that 97% of graduates secure employment or further their education at graduate school within six months of completing the degree. Admission requires licensure or certification in an approved allied health field. Learners pursuing the radiologic science option provide documentation that they hold ARRT registration. Oregon Institute of Technology is regionally accredited by the Northwest Commission on Colleges and Universities (NWCCU). Cleary University ranks #7 on The 25 Best Online Bachelor’s in Healthcare Management Degree Programs! Cleary University equips students with practical business training. The Michigan school’s business programs give professionals the skills necessary to implement effective strategies needed in a global economy. Cleary offers a bachelor of business administration that includes a comprehensive suite of specializations. The BBA in healthcare management prepares managers with a well-rounded education in business and management for the healthcare sector. Students learn from practitioner-faculty who use case studies and project-based learning to highlight the practical application of learned concepts. Business courses include accounting, management, business finance, and financial and managerial accounting. In the third and fourth years, learners focus on healthcare business policy, healthcare informatics, marketing healthcare services, and quality management in healthcare. One of the top healthcare management online degrees, the BBA requires students to engage in two professional projects during the final semester. They fine-tune business competencies with data analysis, development recommendations, and write a project report that they present to faculty. Project options may include the development of a new product plan or an analysis of a workplace problem and solution plan. BBA graduates work in areas such as insurance, managed care, and information systems. Admission requires a high school diploma or GED and SAT scores. Cleary University is regionally accredited by the Higher Learning Commission (HLC). Jefferson ranks #8 on The 25 Best Online Bachelor’s in Healthcare Management Degree Programs! Two colleges united as one when Philadelphia University and Thomas Jefferson University merged in 2017. The new school, just called Jefferson, provides learners with access to programs dedicated to research and innovation. The curriculum emphasizes experiential learning in every discipline, and all students learn in classrooms with a 13-to-1 student-to-faculty ratio. Jefferson Online offers several programs including a bachelor of science in health services management. The 120-credit degree emphasizes management and leadership skills applicable to the healthcare setting. Students take general education requirements in writing, history, and social science. A general education business core introduces learners to the business world with topics in financial accounting; globalization and world politics; and business, industry, and work in America. The healthcare management degree online explores a professional core with topics in economic and financial decision making. Faculty use 15 credits to focus on the emerging issues in healthcare, public policy and planning, health services delivery, and cross-cultural communication and diversity in management. Students complete tasks by applying knowledge and skills during a health services management capstone. Faculty deliver the program using eight-week sessions. Students complete the degree in two to three years depending on transferred credits. Online students at Jefferson pay a flat tuition rate. The also school boasts a new $9,000 tuition discount that increases the degree’s affordability. Admission requires a high school diploma and the SAT for incoming freshmen and school transcripts for transfers. Jefferson is regionally accredited by the Middle States Commission on Higher Education (MSCHE). Nebraska Methodist College of Nursing & Allied Health ranks #9 on The 25 Best Online Bachelor’s in Healthcare Management Degree Programs! Nebraska Methodist College enrolls 1,000 students who study the art and science of healthcare both at the school’s campus in Omaha and through eLearning. Those interested in pursuing administrative roles in healthcare enroll in the hybrid 120-credit bachelor of science in healthcare management. The degree offers five concentrations: interdisciplinary, leadership, education, healthcare administration, and community health. All students in the online degree in healthcare management share a common business core with study of strategic management, financial accounting, budgeting and forecasting, and operations management. A course on health information management examines the use of health records, health information practices, and the responsibilities of healthcare information staff and medical professionals. Learners explore the legal and regulatory issues in a course that explores the role of the healthcare manager as a leader, moral agent, and decision-maker. Students use 21 credits to focus on a concentration. Some students specialize further with one of two, 18-credit minors: healthcare sign language and Spanish for healthcare professionals. The degree also allows students to transition into the MBA in healthcare immediately upon graduation. Full-time students complete the BS in four years. Several scholarship opportunities provide students with a way to help pay for tuition. Admission requires a high school diploma, the ACT, and a minimum 2.5 GPA. University of Alabama at Birmingham – UAB Online ranks #10 on The 25 Best Online Bachelor’s in Healthcare Management Degree Programs! The University of Alabama at Birmingham enrolls 19,000 students in 140+ programs. UAB also houses one of the largest academic medical centers in the U.S. Students engage in extracurricular activities through 220 campus organizations, and they learn on a campus in downtown Birmingham and through the school’s virtual arm — UAB Online. The fully online bachelor of science in healthcare management prepares learners for mid-level management positions at hospitals, long-term care, and other healthcare facilities. The curriculum, certified by the Association of University Programs in Health Administration, includes general manager, clinical manager, and pre-professional tracks. In the general manager track, students work with an adviser to develop a curriculum of professional courses and electives. The clinical manager track only enrolls graduates with an associate degree, certificate, state licensure or other credential in an allied health discipline. The pre-professional track caters to learners interested in a master’s degree in health informatics, health administration, or physical therapy. Learners work with an adviser to incorporate the graduate admission requirements for the chosen specialization into the program of study. For admission, applicants to the online degree in healthcare management must meet individual track requirements and possess a minimum 2.5–2.75 GPA. The University of Alabama at Birmingham is regionally accredited by the Southern Association of Colleges and Schools Commission on Colleges (SACSCOC). Viterbo University ranks among The 25 Best Online Bachelor’s in Healthcare Management Degree Programs! Viterbo University serves as one of 24 Franciscan colleges in the nation. The college offers a Franciscan values-based education in the liberal arts tradition. About 2,800 students study on the main campus in La Crosse, Wisconsin, at satellite centers, and through distance learning. Students study in classrooms with an 11-to-1 student-to-faculty ratio. The bachelor of business administration in healthcare management trains professionals to take on leadership roles. The program requires general education that some students transfer into the BBA. The curriculum explores business topics such as managerial marketing, financial and managerial accounting, and business communications. The BBA focuses on healthcare through study of management in healthcare, healthcare policy and delivery systems, ethical leadership and sustainability, and legal and ethical issues. A course on evidence-based healthcare management emphasizes evidence gathering for effective decision making. Students who need academic assistance participate in online tutoring through SmartThinking. The school’s transfer policy allows associate degrees to transfer into the healthcare management degree online to fulfill general education requirements. Furthermore, students earn up to 30 credits for prior learning. Viterbo offers a seamless transition into the MBA program, which focuses on healthcare leadership. BBA students pay the same tuition regardless of in-state or out-of-state residency. The BBA enrolls students in August, January, and May. Admission requires a high school diploma, SAT or ACT scores, and official transcripts for transfers. Viterbo University is regionally accredited by the Higher Learning Commission (HLC). Concordia University – Wisconsin ranks among The 25 Best Online Bachelor’s in Healthcare Management Degree Programs! Students at Concordia University-Wisconsin receive an education that blends faith with knowledge. Affiliated with the Lutheran Church, the school operates both a traditional campus and a virtual college. The school offers 8,000+ students a comprehensive portfolio of degrees, including 77 bachelor’s. Learners pursuing careers in healthcare develop managerial and supervisory competencies in the 128-credit, fully online bachelor’s in healthcare management. Students take core courses in general education, exploring subjects such as math, philosophy, and world civilization. The major’s sequence of courses delve into healthcare topics such as management principles in healthcare, healthcare marketing, financial issues in healthcare, and healthcare ethics. A unique course on eldercare gives an in-depth analysis of the challenges facing seniors. Students culminate the healthcare management degree online with a 60-hour practicum that requires on-the-job learning in a healthcare setting. Faculty expect learners to develop a journal detailing what they have learned, a reflective plan that fosters professional and personal development, and a research paper on a related topic. The school boasts a 90% job placement rate. Online students pay one tuition regardless of in-state or out-of-state residency. Admission requires a high school diploma and the SAT or ACT for freshmen; transfer students with 30+ credits need a minimum 2.5 GPA. Concordia University – Wisconsin is regionally accredited by the Higher Learning Commission (HLC). Gardner-Webb University ranks among The 25 Best Online Bachelor’s in Healthcare Management Degree Programs! Gardner-Webb University serves as a leader in Christian higher education. While some students study on a 225-acre campus located in Boiling Springs, North Carolina, others choose to earn a degree in fully online or hybrid formats through Gardner-Webb Online. The bachelor of science in healthcare management offers learners a degree completion option. The curriculum combines Christian business ethics with an understanding of the evolving healthcare industry. Students transfer credits into the bachelor’s in healthcare management online to fulfill general education requirements. The business component includes study of accounting, business statistics, financial management, and management information systems. The 33-credit major examines topics such as healthcare quality; international health; healthcare law and ethics; and economics, budgeting, and finance in healthcare. Students integrate the skills and knowledge learned during an internship experience at a partnering firm. Graduates of the program find jobs at hospitals and doctor offices. Gardner-Webb partners with several community colleges in North Carolina, facilitating easy transfer of an associate degree into the BS in healthcare management. Students pay the same tuition regardless of in-state or out-of-state residency. The school boasts affordable tuition and generous financial aid given to 96% of students. Admission requires at least 48 credits with a cumulative 2.0 GPA. Gardner-Webb University is regionally accredited by the Southern Association of Colleges and Schools Commission on Colleges (SACSCOC). Misericordia University ranks among The 25 Best Online Bachelor’s in Healthcare Management Degree Programs! Misericordia University enrolls 2,800 students in 37 programs administered by three colleges. Students learn in classrooms with a 12-to-1 student-to-faculty ratio. The 121-credit bachelor of science in healthcare management offers students an online option to acquire managerial and administrative knowledge of the healthcare space. Students study business principles such as accounting, financial management, and information systems. The online bachelor’s degree in healthcare management focuses on the major with coursework in managed care, healthcare strategic management, and management of human capital. One specialization prepares learners for marketing or sales careers with courses that address the market-related needs of the healthcare industry. Students with prior college credit earn the degree in as few as 2.5 years through an accelerated format. In this option, learners take online courses part-time, completing up to 12 credits per semester. Through the Guaranteed Placement Program, students can find a job in the career of their choice or attend graduate school within six months of graduation — or the school will provide a paid internship in their field of study. Admission to the BS requires a high school diploma or GED and the SAT or ACT; transfer students need a minimum 2.0 GPA. Misericordia University is regionally accredited by the Middle States Commission on Higher Education (MSCHE). The BS in healthcare management is fully accredited by the International Assembly for Collegiate Business Education (IACBE). Granite State College ranks among The 25 Best Online Bachelor’s in Healthcare Management Degree Programs! Dedicated to serving nontraditional learners, Granite State College offers degrees that give students flexibility in learning. More than 77% of New Hampshire college’s students take classes online. Learners interested in pursuing administrative or managerial careers enroll in the bachelor of science healthcare management. The 120-credit degree plan includes general education requirements that many students transfer in. Once they begin upper-level coursework, learners acquire business skills in areas such as statistics, quantitative inquiry, and organizational behavior. They explore the major through studies in healthcare policy; community, culture, and health; health information systems; and fiscal management in healthcare. An integrative capstone in healthcare management allows students to apply knowledge and concepts learned in a culminating project. Upon completion of the degree, learners know how to optimize systems management in their healthcare administrative roles and use financial information to enhance decision-making and organizational performance. The school allows students to transfer up to 90 credits into the online degree in healthcare management; more than 84% of GSC’s student body began their education elsewhere. Students complete a minimum of 30 credits of the degree’s requirements at GSC. The college offers the most affordable tuition of any four-year institution in New Hampshire. Admission requires a high school diploma or GED and college transcripts for transfer students. Ottawa University – Online ranks among The 25 Best Online Bachelor’s in Healthcare Management Degree Programs! Ottawa University, located in Kansas, enrolls 4,000 students both through traditional campuses and through the school’s robust virtual arm. Four schools administer degrees in education, healthcare, the arts and sciences, and business. The bachelor of arts in health care management offers a clinical track for those pursuing managerial or leadership roles in healthcare. The 124-credit degree suits healthcare professionals with clinical or technical training. The curriculum of the online degree in healthcare management includes study of healthcare policy and regulations, quality in healthcare, management of healthcare organizations, and healthcare law and ethics. Students choose one of five concentrations: economics, finance, human resources, marketing, and leadership and management. A capstone course shows students how to integrate the knowledge, theories, and techniques acquired to solve problems and make decisions in healthcare management. Some learners pursue a 20-credit minor that further enhances their credentials and resumes. Minors include human resources, marketing, communication, and Christian studies and ministry. Many students use professional clinical credentials and training to complete the degree in less time. Furthermore, students may transfer in up to 80 credits into the baccalaureate degree thanks to Ottawa’s generous transfer policy. Admission to the BS requires a high school diploma and college transcripts for transfer students. Maryville University of Saint Louis ranks among The 25 Best Online Bachelor’s in Healthcare Management Degree Programs! Maryville University of Saint Louis provides learners with comprehensive programming both on a 130-acre campus in Missouri and online. The school enrolls 8,000 students, of which almost one-half study online. Maryville’s catalog includes 25 online degrees delivered to students in classrooms with a 14-to-1 student-to-faculty ratio. The 128-credit bachelor of science in healthcare management suits both those seeking to enter the healthcare field and professionals pursuing career advancement. The healthcare management degree online includes general education and other requirements that many students transfer in from prior college courses or work experience. The major examines topics such as business operations in healthcare management, healthcare compliance and quality, healthcare management terminology, and revenue cycle management. Faculty provide students with an immersive practicum in which they apply concepts and skills learned in a healthcare setting. The internship also allows students to explore career options. During a capstone, students showcase their leadership potential as they identify a real challenge in healthcare and devise solutions to address it. Graduates find employment in a wide range of occupations, including nurse manager, clinical director, and healthcare practice manager. Students transfer in an associate degree or credits from professional licenses to complete the degree in an accelerated time frame. They pay one tuition regardless of in-state or out-of- state residency. The program admits students three times each year. Admission requires a high school diploma and a minimum 2.0 GPA for transfers. Maryville University of Saint Louis is regionally accredited by the Higher Learning Commission (HLC). Anderson University ranks among The 25 Best Online Bachelor’s in Healthcare Management Degree Programs! Anderson University consists of nine colleges and schools that administer 36 majors and 50 concentrations. Students earn many of the school’s degrees through AU’s growing online platform. Learners interested in acquiring managerial skills while getting a comprehensive business education enroll in the BBA with a concentration in healthcare management. The BBA-HCM requires general education in areas such as the humanities, social and behavioral sciences, and natural sciences. Students develop business competencies through coursework in accounting, economics, management, and computer information systems. They use electives in the healthcare management degree online to explore areas of career or academic interest. Electives also allow students to take courses in a particular area that complements the major. Students complete the fully online degree in four years of full-time study. AU’s Journey Coaches provide learners in online and adult studies programs with comprehensive support to help them transfer credits, develop an educational plan, and navigate the financial aid process. Online students pay one tuition regardless of in-state or out-of-state residency. Admission requires a high school diploma or GED and college transcripts. Anderson University is regionally accredited by the Southern Association of Colleges and Schools Commission on Colleges (SACSCOC). The BBA in healthcare management is fully accredited by the Accreditation Council for Business Schools and Programs (ACBSP). Drury University ranks among The 25 Best Online Bachelor’s in Healthcare Management Degree Programs! Drury University integrates the liberal arts and sciences with professional areas of study. Students learn in classrooms with a 13-to-1 student-to faculty ratio and can choose from among several online options. The school enrolls 3,300 students in 70 programs. Drury offers online degree completion programs such as the bachelor of science in health services management. The online degree in healthcare management emphasizes administrative and supervisory skills. Faculty design the 124-credit curriculum to give healthcare professionals upward mobility, taking into account their prior academic experience, clinical skills, and licensure. Courses focus on leadership, examining organizational leadership, leadership models, and the financial basics leaders should know. A course on conflict negotiation helps students develop the skills necessary to diffuse conflicts through the study of conflict assessment, problem solving, and how to negotiate resolutions. Students also study positive psychology, learning how to apply a scientific approach to help others. A notable course in gerontology examines the psychological, sociological, psychological, and economic factors in aging — and the programs and services available to the elderly. A course in the final semester examines some of the ethical challenges that organizations face. Faculty use case studies to highlight ethical and unethical practices. Admission requires a minimum of 30 credits and college transcripts. Ohio Christian University ranks among The 25 Best Online Bachelor’s in Healthcare Management Degree Programs! Ohio Christian University integrates the liberal arts and professional studies with a biblical education in the Wesleyan tradition. The school’s 120-credit bachelor of arts in business offers a healthcare management concentration. Students learn how to apply business concepts in a healthcare setting while observing Christian principles and values. Learners complete 36 credits of general education in the healthcare management degree online. The business major includes study of accounting, financial management, macroeconomics, and ethics. The healthcare concentration includes study of the healthcare industry, healthcare informatics, and healthcare finance and reimbursement. A notable course covers corporate compliance and integrity, delving into the responsibilities of a healthcare manager. A related course examines legal and regulatory issues pertaining to healthcare organizations, such as the use of medical records, the licensure of healthcare professionals, and malpractice insurance. The capstone serves as an opportunity for students to apply concepts and knowledge learned to solve complicated management problems. The college offers OCU Online Plus, a program that provides enrichment activities that complement students' degrees, such as local internships or nationwide internship opportunities with Operation Mobilization. Some students study abroad in Italy with Saints Bible Institute or blend their online program with summer camps on OCU’s campus. Students pay one tuition regardless of in-state or out-of-state residency; the school offers payment plans to help students pay for tuition. Admission requires a high school diploma or GED and college transcripts for transfers. Ohio Christian University is regionally accredited by the Higher Learning Commission (HLC). Lindenwood University ranks among The 25 Best Online Bachelor’s in Healthcare Management Degree Programs! Established in 1827, Lindenwood University enrolls 16,000 students in 131 programs that emphasize values-centered academics. Each semester the school’s virtual arm offers 31 online degrees and 100+ online courses. Lindenwood offers the 128-credit bachelor of arts or bachelor of science in business administration with an emphasis in healthcare management. Students acquire business skills they can apply in the healthcare industry through the four-year degree. Both fully online degree plans share coursework, with the BA requiring 77–74 credits of business-related courses and electives and the BS requiring 79–81 credits. Both curriculums require general education in the arts, social sciences, and the humanities. Students delve into the major with study of business law, management principles, and financial and managerial accounting. They use 12 elective credits to complete healthcare management coursework. Faculty deliver the healthcare management online degree using 12-week courses. Students learn in small classrooms at one of the best online colleges for healthcare management. The school’s transfer-friendly system allows students to apply prior college credit to satisfy general education requirements. Online students pay the same tuition regardless of in-state or out-of-state residency. Online learners who want to stay involved in campus life access Lindenwood’s student organizations and other activities through Involve U. Admission requires a high school diploma or GED and school transcripts for transfers. Jefferson College of Health Sciences ranks among The 25 Best Online Bachelor’s in Healthcare Management Degree Programs! Founded as a nursing school, Jefferson College of Health Sciences trains professionals for healthcare careers. While the school’s campus is situated at a community hospital in Roanoke, Virginia, the virtual college provides several online options. The fully online bachelor of science in healthcare management enrolls both recent high school graduates and transfer students. Students learn fundamental business principles and the management, analytical, and communication skills required of healthcare management professionals. The 121-credit curriculum requires 30 credits in general education that some students transfer from other colleges. Students acquire business skills with studies in strategic management, managerial communications, and organizational development and leadership. The major examines several topics in healthcare such as healthcare economics and policy, healthcare quality management, population health management, and healthcare revenue and expense. Students specialize their degree with one of two concentrations: medical practice management or long-term care. JCHS gives learners access to state-of-the-art facilities and equipment, and they learn from national experts such as CEOs, financial analysts, and HR administrators. One of the top healthcare management schools online, JCHS provides learners with internship options that emphasize hands-on learning, mentorship, and networking. Students in this program enjoy a 100% placement rate on or near graduation. Students who pursue advanced credentials may use an express pathway into the master of healthcare administration. Admission to the BS requires a high school diploma and SAT or ACT scores; transfer students need a minimum C grade. Jefferson College of Health Sciences is regionally accredited by the Southern Association of Colleges and Schools Commission on Colleges (SACSCOC). Northeastern University ranks among The 25 Best Online Bachelor’s in Healthcare Management Degree Programs! Northeastern University operates a main campus in Boston and four regional campuses that administer 175 majors to a student body of 17,000 undergraduates. Six colleges provide eLearners with more than 70 online programs, including the 120-credit bachelor of science in health management. One of the top healthcare management online degree programs, the BS requires several college writing courses and labs. Students also take foundational courses in sociology, psychology, data analysis tools, and statistics for the behavioral and social sciences. Faculty use 37 semester hours to focus on the major with topics in health law and regulation, health informatics, healthcare operations, and risk management and quality assurance. A course on public health acquaints learners with epidemiological studies and policy development and healthcare planning. Students explore abnormal psychology and epidemiology with the use of 12 electives, and some take a supervised internship within a healthcare organization. Students synthesize and apply knowledge in a capstone that involves an area of healthcare management. Full-time students complete the degree in four years while part-timers do so in seven. Admission requires a high school diploma or GED and college transcripts for transfers. University of Minnesota – Crookston ranks among The 25 Best Online Bachelor’s in Healthcare Management Degree Programs! The University of Minnesota-Crookston enrolls 1,800 students, with a student body evenly divided between on-campus learners and eLearners. Students participate in hands-on learning, receive personalized attention, and benefit from mentorship opportunities. The 120-credit bachelor of science in health management provides healthcare professionals with the skills needed to advance in their careers and high school graduates with the competencies necessary for entrance into the healthcare space. The curriculum of one of the nation’s best healthcare management online degree programs includes general education. Many students transfer in general education requirements. The 62-credit major examines topics such as the healthcare system, medical terminology, healthcare leadership and planning, and healthcare finance. A course on decision making in healthcare acquaints learners with how to use evidence-based data and research to manage projects. Students also participate in a project and learn from a supervisor during a 10-week field experience directed by faculty. The degree meets Minnesota’s requirements to sit for nursing home administrator licensure exams. Online learners may elect to acquire international experience through UMC’s extensive study abroad program, which offers 300+ opportunities in 67 different countries. Faculty deliver the program fully online in an asynchronous format. Students enjoy the same tuition rate regardless of in-state or out-of-state residency. This program requires summer terms. Admission requires a high school diploma and SAT or ACT scores, a minimum 2.0 GPA, and college transcripts for transfers. The University of Minnesota-Crookston is regionally accredited by the Higher Learning Commission (HLC). Western Governors University ranks among The 25 Best Online Bachelor’s in Healthcare Management Degree Programs! Western Governors University was established by a team of governors who set out to innovate higher education. An exclusively virtual college, WGU is also the nation’s first institution with only competency-based degrees. The school, headquartered in Salt Lake City, gives students the opportunity to earn a degree based on what they know, not on their accomplishments within a designated time frame. Each course culminates with learners demonstrating their proficiency using a test, paper, or project. WGU assigns every student a program mentor who provides guidance and instruction. The bachelor of science in business with an emphasis in healthcare management includes lower-division courses in algebra, history, and geography. Students meet some or all of these requirements by transferring an average of 34 credits into the online degree in healthcare management. Students acquire business competencies with study of organizational behavior, business strategy, and management principles. The major includes study of healthcare operations management, financial resource management, technology applications in healthcare, and healthcare delivery systems, regulation, and compliance. All students complete a capstone project in which they demonstrate mastery of the concepts learned by solving a challenge in the industry. Learners pay a flat tuition rate regardless of units (WGUs equivalent to credits) taken. Admission requires a WGU Readiness Assessment (an online test) and school transcripts. Western Governors University is regionally accredited by the Northwest Commission on Colleges and Universities (NWCCU). The BS in business with an emphasis in healthcare management is fully accredited by the Accreditation Council for Business Schools and Programs (ACBSP). Online colleges for healthcare management offer students scheduling flexibility and copious course options. While curricula and specialization options differ between programs, all online healthcare management degrees prepare students for leadership roles in health services. A few sample courses available to students are listed below. Privacy and Protection in Healthcare: Students learn government guidelines and ethical considerations in healthcare agencies. Learners analyze HIPAA laws, informed consent, and the implications of such policies on healthcare services. Coursework examines regulatory aspects of management in a hospital or clinic. The Economics of Healthcare: This course outlines the key economic considerations in the healthcare industry. Students learn about resource allocation, budgeting, market evaluation, and cost analysis. Additionally, coursework addresses state and federal government regulations for health services. This content benefits those planning to work as healthcare finance managers and hospital administrators. Healthcare Administration: With a thorough overview of the global healthcare system and its theoretical basis, this class explores the basic building blocks of management in the health services. The course delves into cost, planning, quality of care, and the future challenges that may arise in this constantly evolving field. Completing a healthcare management degree online prepares students for a variety of career paths within health services. Graduates often pursue roles in medical centers as business administrators or human resource personnel. This degree prepares you to run daily clinic operations, guarantee a positive patient care experience, and manage a hospital’s finances. Healthcare Administrator: Healthcare administrators, sometimes called executives or service managers, traditionally work in hospitals, clinics, or other healthcare facilities. They may manage the entire practice, a distinct clinical area, or a specific aspect of administration, such as finance and budgeting. A bachelor’s degree is usually the minimum qualification for entry into an administrative position, though master’s degrees are also common. Human Resources Manager: Working as a human resources manager in a hospital or clinic is an option for those with an online degree in healthcare management. These managers direct administrative duties, hire employees, review employment laws, and facilitate communication between management and staff. Marketing Manager: Students who earn their healthcare management degree online with a marketing specialization can work as marketing managers in healthcare facilities. Healthcare marketing encourages a conversation between patients and the facility, improving care and growing the client network. The manager gives a facility a trustworthy voice and a clear brand strategy. When evaluating healthcare management degrees online, be sure to check each school’s accreditation. Approved agencies only award accreditation if schools meet educational standards and implement continuing improvement efforts. With the most prestigious standards, regional accreditation applies to most nonprofit, degree-granting institutions in the country. Nationally accredited schools are generally career-oriented trade or vocational schools. The Council for Higher Education Accreditation (CHEA), along with the U.S. Department of Education, oversees both national and regional accrediting bodies to guarantee the integrity of accreditation. The CHEA website offers a list of accredited schools to help in your search for healthcare management online degrees. Prospective students should also consider choosing an online degree in healthcare management that is accredited by the Commission on Accreditation of Health Management Education. This commission supports educational programs and sets measurable criteria to ensure that healthcare management courses continue to provide quality administrative training. Professional organizations provide an excellent point of entry for students joining the workforce after earning an online bachelor’s degree in healthcare management. When seeking career advancement, conferences or seminars, continuing education courses, or additional certification opportunities, involvement with a professional association is crucial. These agencies facilitate professional networking and advocate for their members and the field at large. American Association of Healthcare Administrative Management: Focused primarily on the revenue cycle, this national association connects professionals with the information they need to successfully manage a healthcare organization. The AAHAM also facilitates conferences, publications, and networking to assist members with career development. American Health Information Management Association: The AHIMA — a resource for students, graduates, and working professionals — strives to effectively manage health data and improve public healthcare. This association offers access to continuing education, newsletters, and an engaged community of experts. National Association of Healthcare Access Management: A leading resource on administrative patient services, the NAHAM promotes best practices in policies and seeks to educate healthcare management professionals. Members attend networking functions, access instructional materials, learn from subject-matter experts, and earn additional certifications through the association.